ISLAMABAD, Pakistan (CNN) -- Controversial unmanned aircraft strikes against targets in Pakistan's restive tribal region are not working, the country's prime minister has told the Obama administration's point man for the region. Drone strikes are unpopular among many in the region because of the threat to civilians. "Continued drone attacks in FATA have proved counterproductive and have seriously impeded Pakistan's efforts towards rooting out militancy and terrorism from that area," Prime Minister Syed Yusuf Raza Gilani told Ambassador Richard Holbrooke on Wednesday, according to a press release from Gilani's office about their meeting. FATA is the semi-autonomous Federally Administered Tribal Areas. Delegations for Holbrooke, the U.S. special representative for Afghanistan and Pakistan, and Gilani met at the prime minister's house in Islamabad on Wednesday morning. Pakistani military forces have been conducting an offensive against the Taliban in North West Frontier Province and have targeted insurgents in the adjacent tribal region. U.S.-led forces fighting Taliban militants in Afghanistan are thought to have conducted drone strikes against those targets over the border in Pakistan's tribal region. The strikes have been unpopular among many in the region because of the threat to civilians. Pakistan has said such attacks have claimed hundreds of civilian lives. The U.S. military routinely offers no comment on reported drone attacks. However, the United States is the only country operating in the region known to have the ability to launch missiles from drones, which are controlled remotely. The news release said Gilani told Holbrooke that United States "should share real time, credible and actionable intelligence," and provide "unarmed vehicle technology," and "immediate supply of much-needed equipment and ammunition to Pakistan's armed forces" to ensure a "successful completion of its operation against militants." 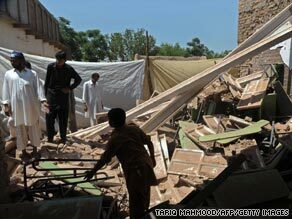 The pair also discussed the dislocation and widespread damage in the war-torn North West Frontier Province. Gilani called for the United States and other countries to help Pakistan rebuild and urged the Obama administration to speed up the passage of proposed legislation that would help the country. Any comment from Holbrooke on the issue was not mentioned in the press release. But Holbrooke is cited as praising Pakistan's fight against the militants and is working on getting the key legislation adopted. He said the United States would provide funds for reconstruction and help for dislocated residents. He said the United States would help other countries to contribute.